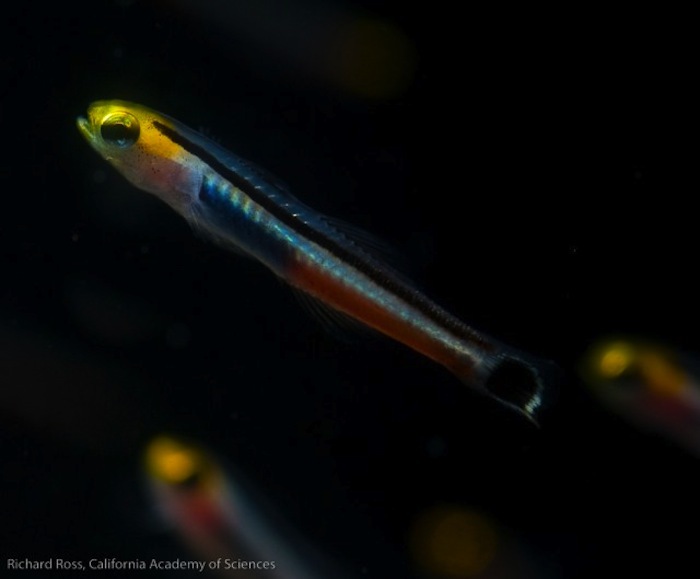 Like all Trimma gobies, the Bluestripe Cave Goby stays small, around 1” as a full grown adult, so will feel right at home in tanks as small as just a few gallons. It is also easy to care for and generally very hardy. What distinguishes this species from most of the rest of the genus is its behavior and sociability. 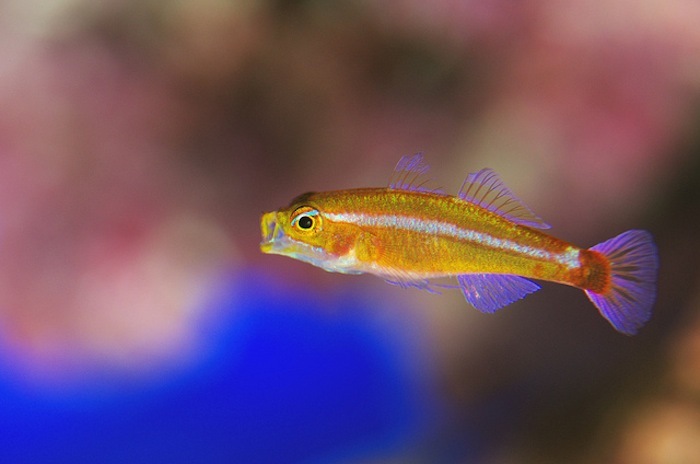 Most Trimma gobies spend their time perching on corals, under rocks, or hanging upside down underneath plating corals in the wild and in the aquarium. Generally, they are pretty good at staying tucked away and blending into the background unless you are looking for them. There are only a handful of Trimma species that spend most of their time hovering in the water column. Of these, the Bluestripe Cave Goby is the most desirable species and the only one that appears in the aquarium trade with any regularity. Instead of perching on rocks, the Bluestripe Cave Goby hovers in a “heads up” position, oriented vertically, where it scans the water for small bits of zooplankton. Another common trait of most Trimma species is that they can be rather pugnacious with each other. This holds true for conspecifics and congeners. Generally each individual will stake out a small territory of its own and defend it from competitors. Although the defended area is typically small and many individuals can fit in a small tank, the interactions between fish are generally limited and antagonistic. However, the Bluestripe Cave Goby gets along fine with conspecifics and is always found in small groups in the wild (Fishbase). A grouping of 6-8 Bluestripe Cave Gobies would get along well in a 10-20 gallon tank and be a realistic representation of how these fish occur in the wild. To duplicate a Bluestripe Cave Goby habitat, create a vertical or steep reef wall with small caves and crevices that the gobies can retreat to if necessary. Generally these gobies spend all of their time out in open water searching for food, but do not stay very far away from a small cave or shelter to quickly dash into at the first sign of danger. These gobies are not found in very shallow water, so subdued lighting of a high Kelvin temperature will suffice to recreate a natural look. However, they will adapt fine to bright lighting as well. 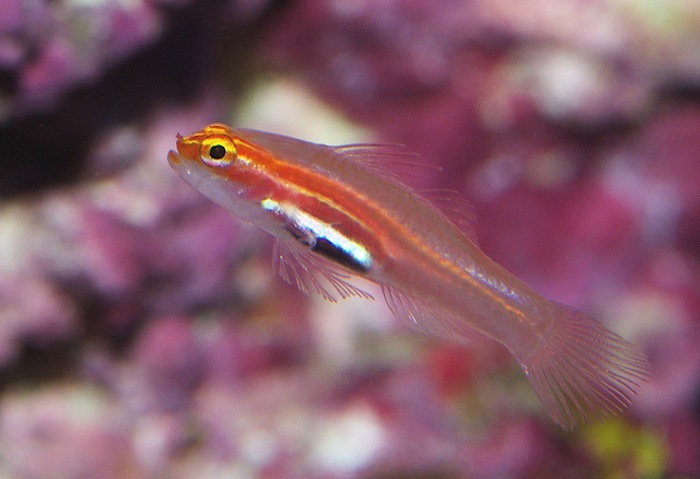 Feeding for all Trimma species is simple although it should be done frequently for the Bluestripe Cave Goby. 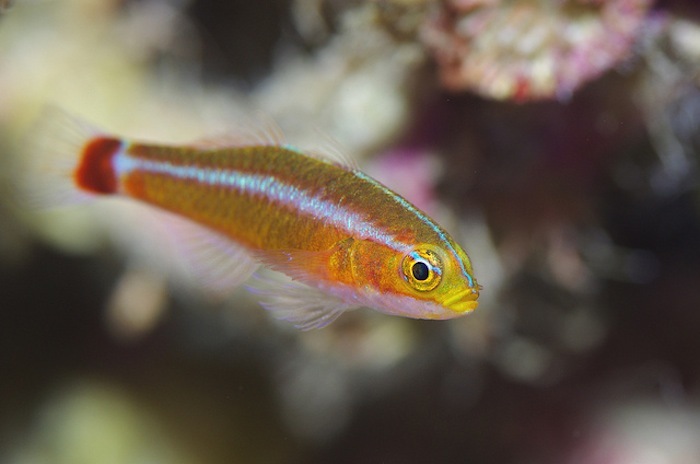 All Trimma gobies will take to frozen, flake, or pellet foods within a short amount of time, although live baby brine shrimp, Daphnia or copepods may be necessary at first to induce a feeding response. For the more benthic Trimma species the resident microfauna in a mature tank may be more than enough to sustain their diet without any targeted feedings whatsoever. Amphipods and copepods will breed furiously in any reef aquarium, and even a small tank can have enough of a population of these “pods” to keep a 1” goby happy. 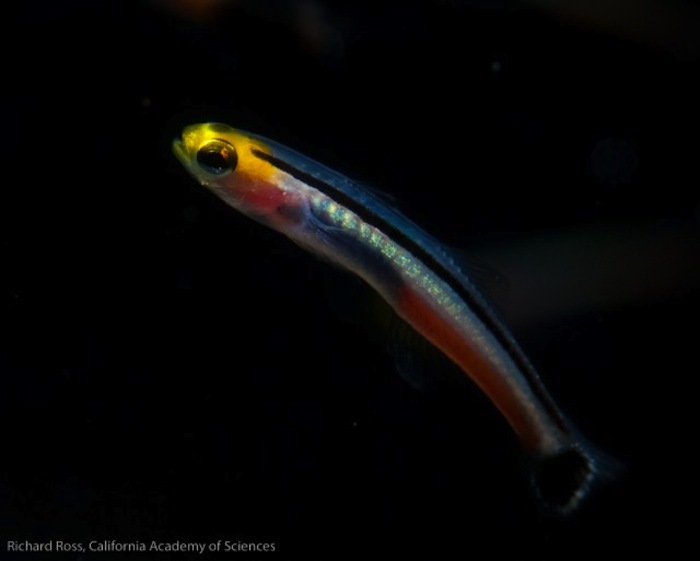 However, for planktivorous gobies like the Bluestripe Cave Goby targeted feedings will need to be done at least twice daily. Amphipods and copepods in a reef aquarium tend to stick to the rocks, sand and glass, but these fish hunt in the water where food availability tends to be very low in reef aquariums. Given a good feeding regimen, good water quality, and a lack of any predators big enough to consume a 1” goby, a Bluestripe Cave Goby can live for as long as 2 years in an aquarium. The Waikiki Aquarium had one individual that lived for 20 months in captivity (Delbeek and Randall, 2009), and I have had one individual, acquired as an adult, that lived around 24 months. 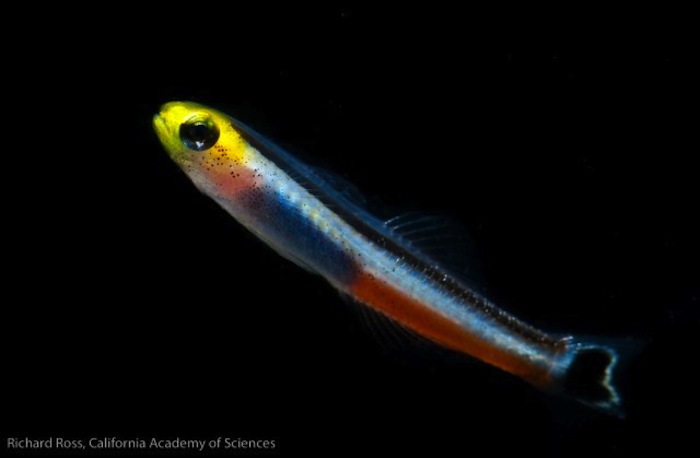 The only downside to the Bluestripe Cave Goby is its availability in the aquarium trade, which is sporadic and almost never in large quantities. This species was virtually unavailable in the trade before 2004, and its availability has only slightly increased since then. However, when it is available it is not at an unreasonable price, generally between $20-40. The Dwarf Dartfish, Aioliops megastigma The Dwarf Dartfish is a relative rarity in the aquarium trade, but is closely related to the much more familiar dartfishes in the genus Ptereleotris and firefishes in the genus Nemateleotris. Like other ptereleotrids, the Dwarf Dartfish spends virtually all of its time sculling in the water column, faced into the current to catch very small zooplankton that floats by. When I say very small zooplankton, I mean stuff around 1 millimeter in size or smaller, because the Dwarf Dartfish tops out at a whopping 1” in length as an adult. This species is very slender bodied, much more so than the Trimma or Eviota gobies which reach similar length as adults. The Dwarf Dartfish is likely one of the smallest tropical marine fish, by mass, that an aquarist can purchase. Not surprisingly, this presents special challenges when it comes to feeding (more on this later). A typical reef tank with high light, high flow, and a mix of stony and soft corals will be a suitable recreation of the Dwarf Dartfish’s natural habitat. The species has a wide distribution in the Western Pacific and occurs on shallow coral reefs where they hover above corals in groups (Fishbase). However, when designing a tank around these delicate little fish you need to make special considerations for their tiny size. Propeller driven pumps should have foam covers over them. Overflow boxes should have fine window screening blocking the teeth. Dwarf Dartfish are highly adept jumpers and will fit right through loose mesh, so a simple mesh cover may not suffice. A solid clear cover, or high walls around the lip of the tank frame are sufficient to keep them inside the tank. Finally, fish and invertebrate tankmates should be chosen wisely. Obviously any outright predators such as wrasses, hawkfish, dottybacks, or cardinalfish should be avoided, but even some invertebrate species normally thought of as “safe” should be treated cautiously. Large brittle stars, Lysmata shrimp, and even many corals are fully capable of capturing and eating Dwarf Dartfish if given the chance. Snails and urchins will suffice for a clean up crew; small gobies, pipefishes, mandarinfishes, shrimpfishes, and other small crustacean predators will make fine fish tankmates. Of course the best fish tankmates of all are… more Dwarf Dartfish! The most difficult part about caring for Dwarf Dartfish is feeding them appropriately. These fish tend to lose weight fast when not fed frequently due to their rapid metabolism. Couple that with their tiny size and nearly nonexistent fat reserves, and you have a fish that needs a nearly constant supply of food while it’s awake. To make matters worse, Dwarf Dartfish only tend to eat live foods for the first few weeks in captivity. A steady diet of live baby brine shrimp, live copepods, and/or live rotifers will sustain them for a while, but obviously they should be switched over to prepared foods very quickly unless you have a lot of free time to spend culturing live foods! I have had good luck feeding them very small pellet diets in the range of 250 microns designed as larval shrimp feeds. In any case, I would not purchase these fish without already having cultures of live rotifers, copepods, and/or Artemia nauplii up and running at least for the short term. Unfortunately, even if the delicate nature and difficult husbandry of the Dwarf Dartfish are accounted for, this fish does not appear to live very long. Captive longevity for animals acquired through the aquarium trade appears to top out at about 12 months. I hope you’ve enjoyed this look at some unique species of fishes that can be kept in shoals in your reef aquarium. In the next issue of Reefs Magazine I’ll be discussing the husbandry and captive reproduction of a poorly understood yet highly coveted genus of marine fishes—the Ghost Pipefishes (Solenostomus spp.). Until then, happy fishkeeping! References Fishbase.org Randall, J.E. and J.C. Delbeek. 2009. Comments on the extremes in longevity in fishes, with special reference to the Gobiidae. 447-454, 6 figs., 1 table. Proceedings of the California Academy of Science, Series 4, V60, Nos. 1-9.